MOSCOW, Feb. 14 (Xinhua) -- Lanterns, red envelopes, the Friendlies, decorations to mark the incoming Year of the Dog ... These can be found as far away from China as Moscow. Despite freezing temperatures, the warm festive atmosphere of the upcoming Chinese Lunar New Year has spread to the snowy Russian capital. 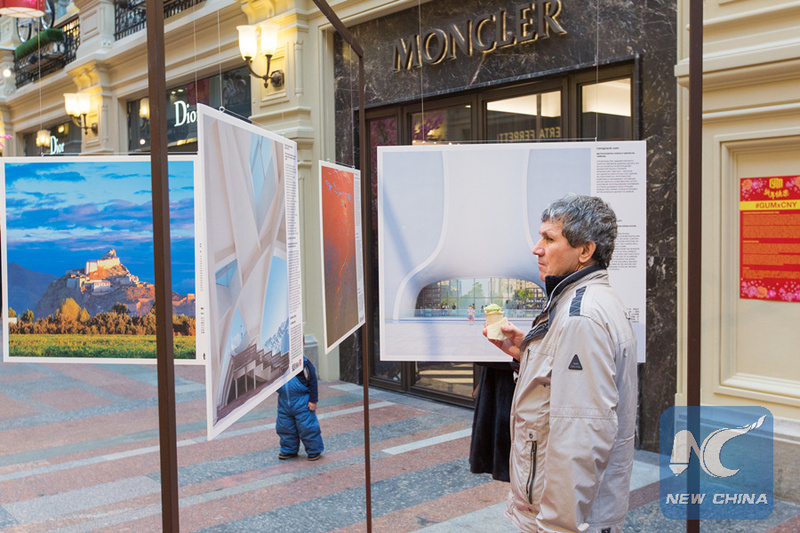 Containing these classic elements in Chinese culture, a series of eye-catching pop art structures are displayed in downtown Moscow's iconic GUM State Department Store next to the Red Square. 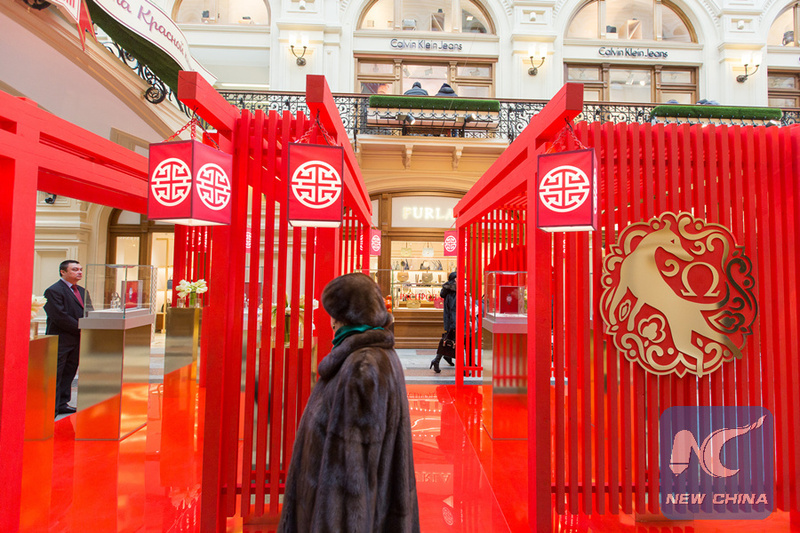 The shopping center is jointly holding with the China Cultural Center in Moscow a spectacular 20-day theme event featuring the Chinese New Year, also known as the Spring Festival. "We held many consultations on how to celebrate the Chinese New Year. We tried not to use traditional Chinese red lanterns, but nevertheless, we turned to history and tried to make a connection between Chinese traditions, Chinese art and modern China," GUM's managing director Teimuraz Guguberidze told Xinhua. Designed by a talented Chinese contemporary artist, the art installation unites cultural elements of China and Russia, such as China's Friendlies dolls and Russia's Matryoshka dolls as well as China's "blessed eggs" and Russia's Faberge eggs, marking the occasion of the festival with rich visual effects. "The Spring Festival is perfect when it's snowing outside. We gladly used the bright colorful decorations of Jackie Tsai to create a special atmosphere," said Guguberidze. In such a joyful setting, a number of traditional Chinese art performances including the Dragon Dance, the Yangko Dance and the Change of Masks stunt, as well as the Chinese embroidery exhibition "The Great Silk Road" and the art of Chinese tea tasting are presented to customers both at home and abroad. China's modern culture is also highlighted, with the program including food by a three-Michelin star chef, the photo exhibition "Contemporary China: 100 New Places to See" and the screening of classic Chinese movies. "We see how progressive and fashionable China is today, and this is how we want to portray China to tourists," said Guguberidze. The GUM event is part of the "Joyful Spring Festival" celebrations sponsored by the Chinese Ministry of Culture, which started in 2001, with the aim of popularizing Chinese culture among people across the world. Gong Jiajia, cultural attache at the Chinese Embassy in Russia and director of the China Cultural Center in Moscow, said that the GUM event is a manifestation of "high-level cultural exchanges" between the two countries and that Chinese people are happy to show their Russian friends the beauty of the most important festival of the year in China. "Many Russians still have limited understanding of China and I believe the GUM event will certainly make them interested in China's rich cultural heritage... 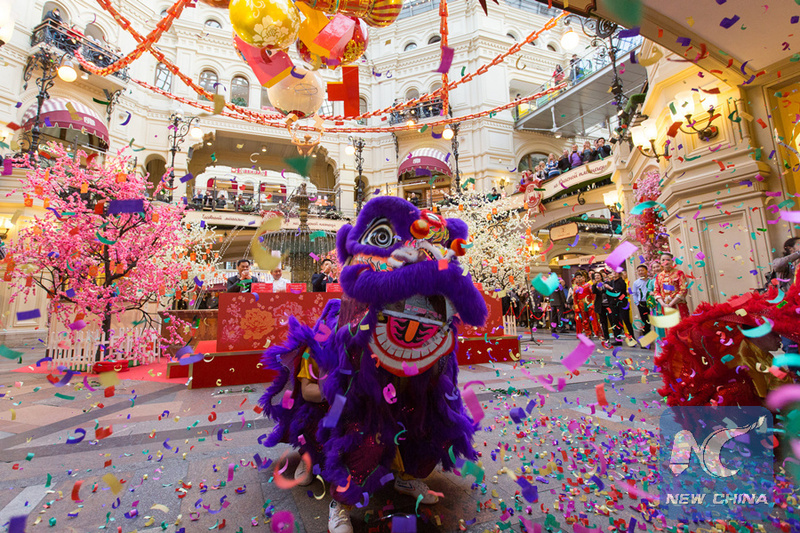 I hope this wonderful initiative is not limited to this year and will turn into an annual event celebrated together by Muscovites and tourists for the Chinese New Year," said Kirill, a 30-year-old local citizen who lives in northern Moscow. It is also a sign of how much Russia values Chinese customers. With more and more people spending the New Year holiday abroad with family and friends, Russia, especially Moscow, has quickly become one of the most popular travel destinations for Chinese tourists, which features great growth potential for Russian businesses. Statistics of the Russian Federal Tourism Agency showed that a total of 1.5 million Chinese tourists visited Russia in 2017. According to GUM's estimates, about 400,000 of them have visited the department store, accounting for about 10 percent of all purchases, and the numbers are still growing. Substantial business opportunities are also seen in Moscow's hotels and catering services during the festival. With dozens of Chinese restaurants all over the city, it is not difficult for Chinese tourists to treat themselves to a decent traditional family dinner on New Year's Eve. Those who are adventurous can go and try Russian cuisine. Now Russia is trying every means to cater to the "VIPs" from China. 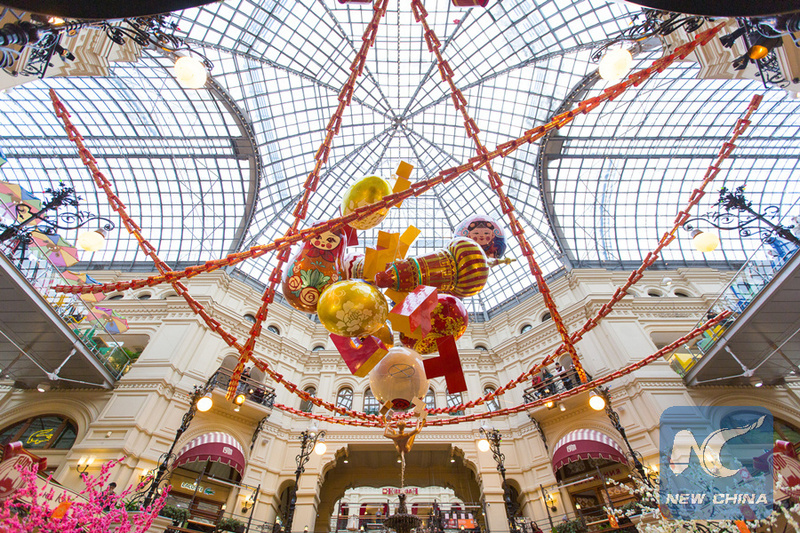 In order to promote sales during the Chinese New Year holidays, major shopping centers in Moscow are providing special discounts and offers, in addition to the exemption of value added tax for foreigners. Some stores like GUM have also intensified their customer service in the Chinese language to "ensure the comfortable stay of Chinese tourists." "We invite our Chinese partners to train our staff and teach the basics of the Chinese culture and traditions in order to make it easier for them to establish communication with Chinese tourists. This is not an easy task. We plan to keep doing this in the future," said Guguberidze.